Now that we are quieter over the winter months I am making the most of my dog walks around beautiful Bude, especially when it is not raining! We are very lucky to live here, in such a lovely part of the country. We often head for the beach which is glorious on a clear, sunny day at this time of year. 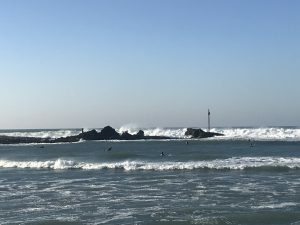 There are still a few hardy surfers in the water on a good day and keen swimmers in Bude’s Sea Pool. One of Bude’s landmarks, Barrel Rock, at the end of the breakwater. 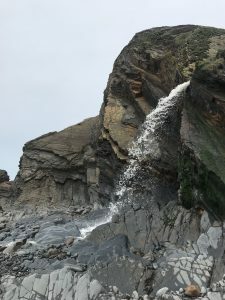 The waterfalls at Sandymouth beach are always worth a visit, especially after a rainy spell. 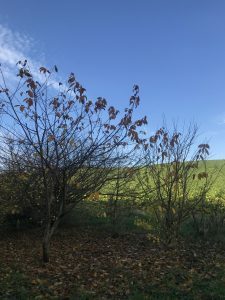 I’ve also been trying to find some good spots to take in Autumn colours this year – too often the leaves get blown off the trees in a gale. The new footpath/Segway route/cycle path between Whalesborough, just down through the village, and Widemouth is a great place for a walk, as is the Bude canal tow path. 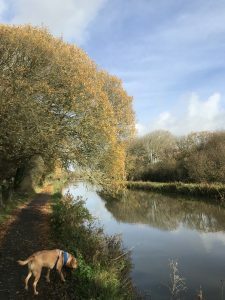 Bude canal – walk into Bude along the canal. Use the car park at Helebridge for a shorter walk. 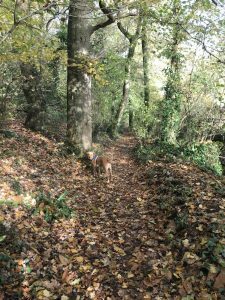 Rustling through the Autumn leaves on the footpath between Whalesborough and Widemouth. Autumn colours on the footpath near Widemouth. The sunsets at this time of year are also spectacular. 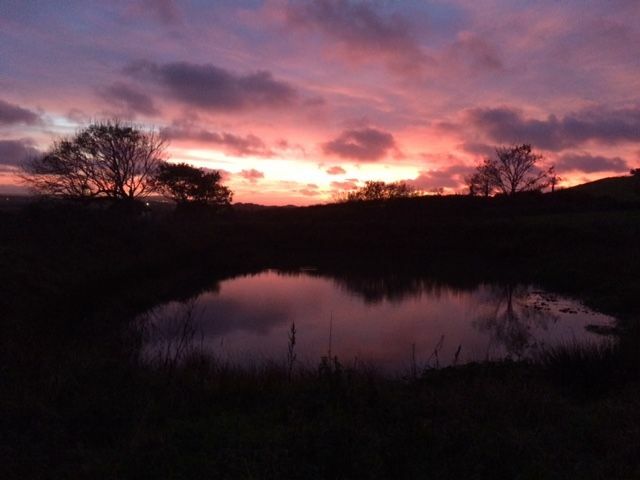 A guest recently took a photo of the sunset reflected in the pond in our field (open to guests when the cows aren’t around). A November sunset reflected in the pond.